Cristen Clark holds a baby pig while spending time with her son, Barrett, on their family farm in Runnels, Iowa. Cristen Clark created her blog, Food and Swine, to be an ag-family album, cookbook and love letter to life on the farm. Through the blog, she shares stories about her family members, demonstrates how farm machinery works, provides details about their crops, tours their hog finishing barns, explains how modern farming feeds the world and shares recipes for dishes from her kitchen. Cristen is the sixth generation of her family to farm in Runnells, Iowa, where her great-great-great-great-grandfather, J.C. French, settled in 1869. She and her sister, Tanna Weyers, farm corn and soybeans with their parents, Rodger and Ceil Slings. 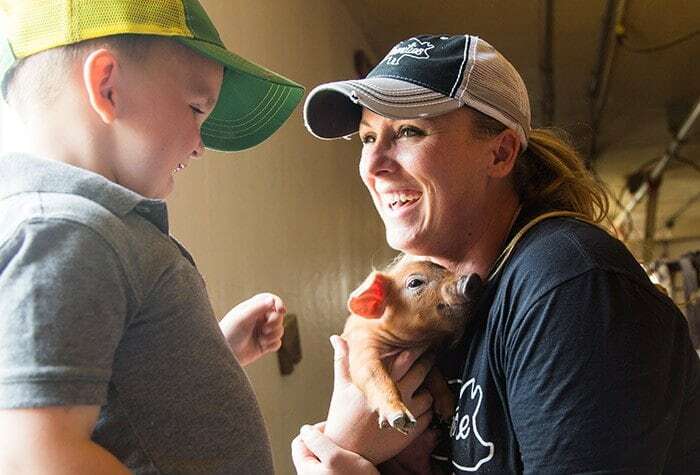 Cristen and her husband, Mike Clark, also finish feeder pigs and raise show hogs.
.@FarmHer1 and @SyngentaUS #NotAfraidtoWork winner’s blog is a love letter to family, farm and food. Judging by stacks of photos of the Clark and Weyers kids reveling in farm chores, the seventh generation is following closely in their footsteps. One of these photos, an image that she snapped of her son with her father in matching overalls after a day they shared in the combine, won the Syngenta #NotAfraidToWork contest in 2016. For Cristen, this photo epitomizes the legacy J.C. French started. “What would he think if he knew that seven generations later, some of his blood was standing right there and farming and doing what he was doing in 1869?” she asks. Even Cristen’s recipes are rooted in family. Cristen’s blog is loaded with recipes perfect for feeding a hungry family after the tractors are in the shed and the animals are fed. Each one is peppered with comments on food and farming, as well as explanations of the science behind cooking. For example, in one post, she includes a tip to mash potatoes before adding milk and sour cream, so the dairy products don’t bind with the spuds’ starch and make the dish gluey. Each recipe page features photos showing younger family members smiling, riding in the combine with Rodger or Tanna, leading show pigs around the farm, helping Mike in the finishing houses, and falling deeper in love with farming every day. Cristen says growing up on the farm instilled in her a strong work ethic that drove her as a student and athlete at Drake University and led her to perfect the recipes that won Sutter Home Vineyards’ Build a Better Burger and Iowa Egg Council’s Decadent Desserts contests. Today, she says it allows her to handle the challenges of her busy days as a farming, blogging mom. Some lessons even take Cristen by surprise—like the reminder to savor the moments of family time. One of those lessons came the day she shot the photo of her son and father that won the #NotAfraidToWork photo contest. It had been a hot, dry fall with great weather for cutting corn and soybeans. In the middle of that harvest day, her dad stopped the combine. The tension broke when he announced that it was time to take a break and enjoy each other’s company with an impromptu harvest-time pizza party.